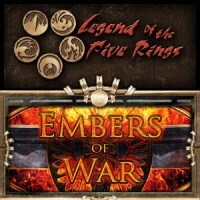 Embers of War is a powerful set that provides a lot of options for all levels of Legend of the Five Rings players. Embers of War, the first expansion designed solely for play in the Emperor Edition arc, brings us into the jungles south of Rokugan as the Great Clans vie for land under the first expansionist period in the Empire’s history. With 159 new cards, Embers of War begins to develop some of the minor themes explored in the base set, as well as giving decks of all types some new and powerful tools. With Embers of War, Legend of the Five Rings gets a fresh update of an old (and since retired) card type, the Sensei. Now a subtype of the Personality cards, the Sensei included in Embers of War give each of the Great Clans a potentially powerful trait that will affect the game as long as the Personality remains in play. This is balanced with this first run of Sensei being Loyal to their faction, as well as each one having a second trait that would discard any other Sensei Personalities in play when they hit the table. Armed with new cards to inspire greatness and these powerful Sensei to lead them, the land race in the name of the Divine Empress brings the Clans at odds with each other, even as a still unknown and unnamed threat attacks their supply caravans in the wilds outside of the Emerald Empire. As with each expansion, three Clans are featured and receive a new Stronghold and corresponding Starter Deck. With Embers of War, the set focuses on the Lion, Spider and Unicorn Clans. Each Starter Deck continues the trend in Emperor Edition, by containing an 80 card, fully playable deck, this time built around the new Stronghold. Also included in the decks are two more exclusive cards, one Personality and one Item, unique to their faction. The Personalities synergize nicely with their new Strongholds, and the Items, updated versions of the iconic Celestial Swords, give the starter decks their real punch. While each Starter Deck is playable right out of the box, they do unfortunately suffer from a decided lack of power compared to any customized constructed deck and even lack a bit when held up to the pre-built Emperor Edition decks. Surprisingly included in each of the decks was a playset of the Clan Virtue Strategy which was assumed to only be found in the Emperor Edition Starters. While their power level is a bit low for the beginning L5R player, the Starters continue to ooze the flavor of Rokugan and their Clan, which is to many, the biggest selling point of this CCG. The decks themselves include an insert with a short story setting the flavor of the expansion on one side and the set checklist and brief rules clarifications on the other. Also included in each starter are four random Rares, this time all packaged together at the back of the deck for ease of finding. Looking over the set as a whole, it is very clear that the designers had a very focused idea of where they wanted to go with this set, and the direction of the Emperor Edition arc as a whole. Underdeveloped themes get a few new (and for the most part good) Personalities, as well as a few Strategies and other Fate cards to support them. The already present themes in Emperor Edition got some support, but not so much that they will continue to be the only decks played at tournaments and events. Overall, Embers of War continues to push the game in the Attack Phase, focusing on in-Battle strategy while still giving Action Phase decks a few tools they needed to help their win conditions without upsetting the balance of control versus aggro decks. Of note as well, is the continuation of a strong sense of ability negation, including the much talked about card, Inexorable, which can make a negation effect fizzle. These meta-meta cards exist in the set to a high enough degree that judging the environment prior to an event or tournament promises to be just as important as your play-skill once there, which can be equal parts exciting and aggravating for an experienced player. So what decks and themes are the biggest winners in Embers of War? It really feels like Dishonor decks get some of the biggest boosts, from cards such as Yasuki Makoto, Soshi Yoshihara Experienced, The Heir’s Wrath and The Host’s Advantage. This is welcome, as that particular win condition was probably the one most struggling to get off the ground at the start of the Emperor Edition arc. Also getting a decent boost, Blitz Military get a few new tools, most notably Low Market, as well as Crane Scouts get some needed muscle with two new Personalities and the Strategies, Two Fronts and Scouting the Pass. Enlightenment decks see some of the most powerful, but also most specific meta printed against them in this set, specifically Indecision and The Scorpion Wall is Finished, both of which attack their ability to search for and/or draw several cards a phase to combo out their victory condition quickly and without much warning. Physically, the cards do seem a slight bit less colorful than the Emperor Edition printings, feeling like the inks are less saturated, giving them a slight paleness to them. This however is a better end of the spectrum than the over saturation of inks that occurred frequently in the Emperor Edition print run, which left some cards with ink spots obscuring the art and text. Make no mistake this is a powerful set, and fortunately the power isn’t in strict upgrades to existing cards, but more in giving new tools to decks that needed it. It also pushes the boundaries of areas of design, such as with the Sensei Personalities and new Strongholds which now give their respective Clan Theme two options to build around, neither one obviously stronger than the other. The set provides a lot of options for all levels of player, from the kitchen table casual enthusiast to the Kotei Tournament veteran. It really is an exciting time to be playing L5R. Where the set really shines is in the art direction. While the card art has long been a major part of CCGs, never before has a Legend of the Five Rings set given so much flavor and quality in its selection of art. Many new artists really stun with strong debuts, as well as many popular artists returning, giving us the styles of art that shaped and pervaded the nostalgia of the game’s sixteen year run. One really has to give Steve Argyle and Adrian Burton a lot of credit for the success of Embers of War. Don’t believe me? Simply look at the booster pack design and tell me you don’t immediately get the foreboding feeling of inevitable conflict as a grim visage of a fully armored Samurai glares at you from over the smoldering logo. Embers of War, indeed. In the distant Colonies, once known as the Ivory Kingdoms, the samurai of Rokugan gather the resources the Empire needs to survive. Threatened by unknown enemies and pitted against one another in politics and economics, will their honor and steel prove strong enough for the Second City to survive? Embers of War is the brand new expansion for the fan-favorite Legend of the Five Rings Collectible Card Game from AEG. 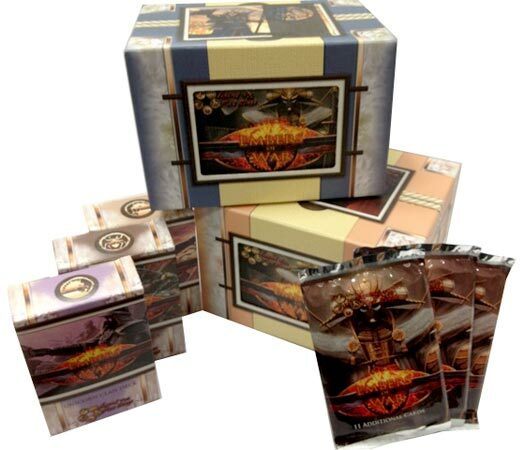 It follows the release of Emperor Edition, the new base set, in February 2012. Now that peace has settled and the riches of the new land conquered by the Empress’ forces are discovered, new alliances and rivalries are formed, both on the mainland and the Colonies. Who will benefit the most? Featuring Lion, Spider and Unicorn Clan starter decks. 159 total new cards legal for the Emperor Arc, including 1 exclusive fixed card and a theme-oriented Stronghold in each Starter Deck. Amazing art from acclaimed artists in the industry, bringing life to both the characters and the land of the Emerald Empire. The beginning of a new conflict between Clans, far from the eyes of the Empress, as they discover immense treasures and resources in the Colonies. This promises to be a pretty exciting expansion. With the new Spider Stronghold, The Plain of Glass, it will allow you to use the Conquest ability twice via this stronghold. It also allows you to equip Followers during the Battle Phase which is normally only allowed during the Limited Phase. This could be a potential game changer for Spider Clan players. Also do not overlook the sheer awesomeness of the Shadow Dragon. Add a Review for "Legend of the Five Rings – Embers of War"